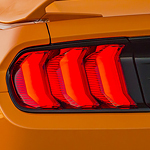 The Ford Mustang has been re-invented over and over, but somehow, since 1964, this beautiful American sports car has driven a well-defined course of power and prestige. The latest Mustang models are top-of-line with fine-tuning by some of the best sports car architects in America. At the top of this year's most wanted list by Mustang enthusiasts, the Mustang BULLITT shows what it means to have true, iconic power with a special body style reminiscent of the historic coupe from the 1970s. In fact, the BULLITT is named for Steve McQueen's Bullitt. This commemorative limited edition sports car is just one of 14 styles being released as of 2019. There is also a California Special Edition, which has a few sportier features than the other trims. You can check out a number of different Mustangs. To feel the power under your feet, take a test drive at Mojave Auto Group.